This townhome is a perfect location for a relaxed, rustic mountain retreat. Boasting two family rooms, a game room with pool table and foosball, and proximity to outdoor adventures, you are sure to make lasting memories at C503! Main Level: Kitchen, living room, dining room (seats 8), half bathroom, laundry room, patio, and entrance to two car garage. Upstairs: One master suite bedroom with full bathroom, two standard bedrooms, and hallway full bathroom. Basement: One bedroom, one full bathroom, sitting room with TV, and game room. Bedroom 1: Master suite - 1 King bed, full ensuite bathroom with jetted tub, glass shower, and double vanity. Bedroom 2: 1 Queen bed with shared full hallway bathroom. Bedroom 3: 1 Queen bed with shared full hallway bathroom. Bedroom 4: 5 twin beds including two bunk-beds, and shared full bathroom with jacuzzi tub/shower. Sitting room downstairs: 1 Twin daybed. 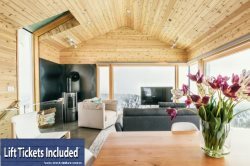 We are truly excited and honored to share our homes with each and every guest and we invite you to stay with us at Powder Mountain Getaways - C503!